I am the worst at acknowledging special days like Mother’s day, anniversaries, and birthdays. Even if I remember, it’s rare that I get it together to do something for someone. In my defense, I am this way about my own important dates. I’d just as soon skip my birthday, and last month I had to ask my husband the exact date of our marriage for a form I had to fill out. Naturally, Mother’s Day is here and I’ve done nothing. So in desperation, I thought I’d post a list of some of the wonderful things my mom has done for her children. And since she is one of my three (wait, I may be up to four) readers of this blog, I’ll count it as my “card”. I’m pretty sure this is cheating, but it beats my usual. My mom is a wonderful role model. Her patience, her acceptance of who we are, her genuine love of all ages and stages, her creativity… But what really makes my mom amazing is that she did all this without having had a positive role model of her own. My job is a hundred times easier than hers was - all I have to do is think about what she did. But she came up with all this stuff on her own. She’ll probably try to tell me she learned from her German host mother, but really, that was only one year when she was in college and couldn’t possibly account for all she did for us when we were children. This list* is incomplete as there are many wonderful things my mother has done with us and for us. But here are a few of my favorites. Some were little, every day things that just made life really nice and others had a significant influence on my life. I hope to be able to do these things with my children. Except for drop shot drills at 6am, I don’t think I’ll do that. Or bologna and mustard sandwiches, because that is actually pretty gross. Thank You Mom. Happy Mother’s Day! *Since this list is probably only interesting to my mom and my sister, other readers (both of you) should feel free to go here (my favorite blog) to read something more interesting. Riding on the back of your bike down, down, down to Tower Road beach. The googly eye stickers on your bike seat. Getting picked up from preschool with Bee cat in the back seat. Riding to preschool on a sled in the winter. Bologna and mustard sandwiches cut out with the gingerbread man cookie cutter. The Mugo plant in the Rosewood garden. Half birthday parties with shiny invitations made from tinfoil. Sending me to summer camp and to Sweden. Drop shot drills at 6am. Driving me all around the Midwest for tennis tournaments… and listening to my music the whole time… and liking (or pretending to like) it. Getting me out of chemistry. Chocolate malts… and now lattes. Introducing me to When Harry Met Sally, then watching it with me dozens of times, then listening to me recite it on road trips. Always being so kind to my friends. 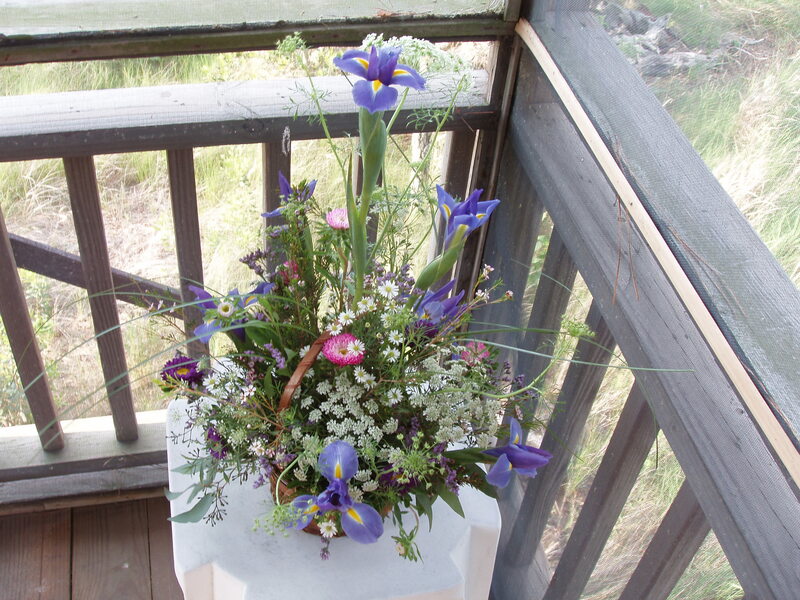 My wedding flowers (I don’t remember the date but I do remember the beautiful flowers). Six weeks in DC so I could finish my dissertation. Coming with one week’s notice to help with #3. And many, many more things.